Planning and executing a successful dinner party for four is a far less complicated task than satisfying the intellects and appetites of twenty. Often, the smaller the scale of the project, the simpler the process. Not so in landscape design. Landscaping small spaces – the city lot – can require just as much planning, and in many cases, more careful design considerations than landscaping a suburban home on a half-acre or larger lot. No room for an expanse of lawn or a wide array of large trees and shrubs leaves little room for error. Renovating an old, fatigued landscape on a small lot means placing the existing trees and shrubs under severe scrutiny. This always is an important first step regardless of lot size, but with smaller properties, every square foot is precious. Cast a stern eye on each tree and shrub. Does it help or hinder? Small lots require small evergreens, small shrubs, and plenty of annuals and perennials. Most deciduous shrubs have value in the landscape for only twenty to twenty-five years. They get woody, misshapen, and lose vitality long before they expire naturally. Quite often, large shade trees on your property (or your neighbors’) have grown over the decades to now cast shade on blooming shrubs that once luxuriated in sun. No amount of renewal pruning or advanced coppicing skills are going to revert them to the boyish good looks and vigor of their youth. Err on the side of removal. Over time, evergreen shrubs suffer even more. It is sometimes possible to prune shade-loving yews back into something of aesthetic value, but arborvitae and junipers of all varieties tend to turn ugly as they age in shade, offering little recourse. And what of the large shade trees? I rarely recommend removing a mature, healthy deciduous tree. Perhaps a trimming to remove dead wood and thin out the crown will open more space to sunlight. But removal is not wrong, if the aged beast casts much of the property into shadow. One can always plant another, smaller tree, usually in a better spot. Large evergreen trees on small lots are an easy call. Do they still look good? Or have they lost base branches, either naturally or via improper pruning? Was the pruning necessary because they began infringing on the sidewalk, driveway, or house structure? They probably looked cute when they were planted fifty years ago, but have grown too large for the yard. It’s wise to revert to the lawn-to-landscape ratio of the 1930s, when a city lot rarely contained more than forty percent lawn. This ratio blew out the window beginning in the 1950s, as Americans developed the suburbs. Sprawling lawns – encompassing ninety percent of the property – became the norm. If you need some area of grass for safe child’s play, consider a stretch of lawn in the back yard, planting the perimeters and corners of the lot flush with shrubs, small trees, and flower gardens. If the kids are gone, why have any lawn at all, except as accent? 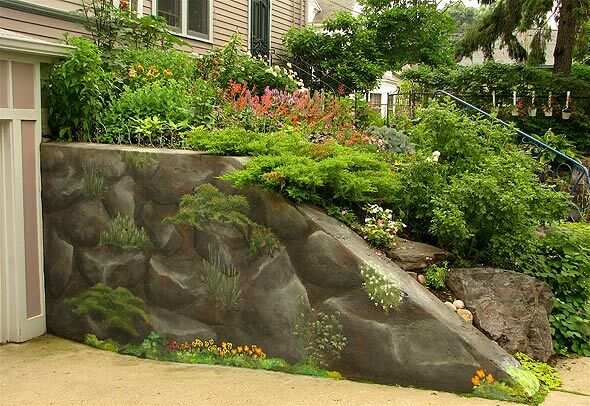 Use lawn as the matte of the painting, slender slivers of green that serve as the defining edges and pathways through and around the flower garden(s) and other landscape plantings of a higher order. In small lots, small trees help maintain scale. Rely heavily on small trees and upright shrubs. 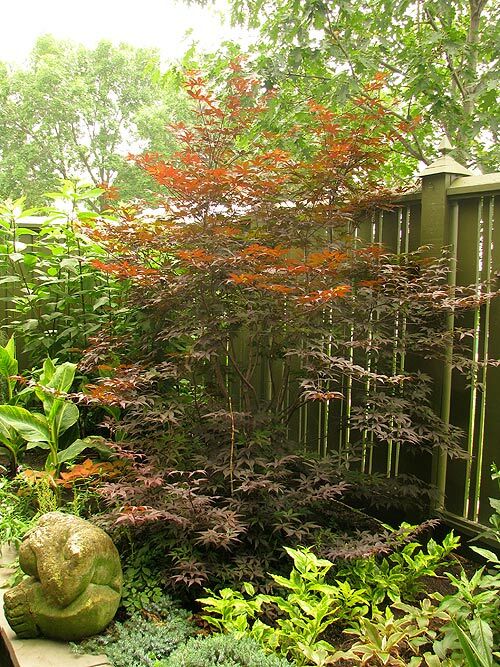 The nursery industry has developed many hundreds of dwarf, columnar and otherwise tidy trees and shrubs that are perfect for small lots. 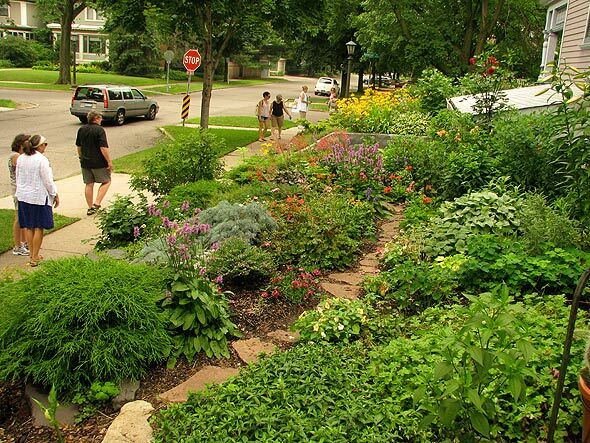 Use small trees, shrubs and blooming perennials with scant lawn to nestle the house in nature. 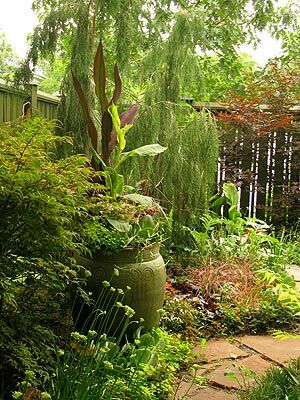 The two side yards can be filled with these plants from house foundation to side property line, with gently curving pathways leading through the landscape from front yard to back. Dwarf evergreens, small ornamental trees, upright perennials and perennial groundcovers are attractive additions to the front of the home.